Download "The Mechanics of Arrow Flight upon Release"
1 The Mechanics of Arrow Flight upon Release Lieu, D.K. 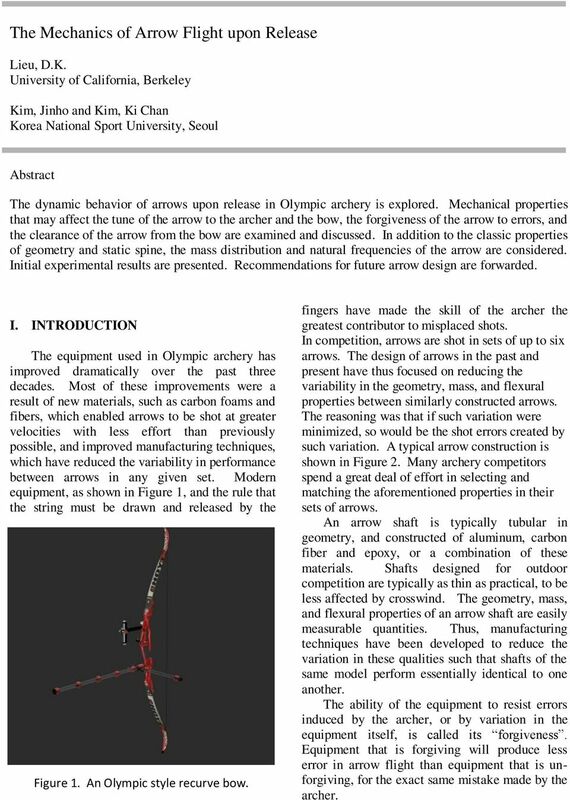 University of California, Berkeley Kim, Jinho and Kim, Ki Chan Korea National Sport University, Seoul Abstract The dynamic behavior of arrows upon release in Olympic archery is explored. Mechanical properties that may affect the tune of the arrow to the archer and the bow, the forgiveness of the arrow to errors, and the clearance of the arrow from the bow are examined and discussed. In addition to the classic properties of geometry and static spine, the mass distribution and natural frequencies of the arrow are considered. Initial experimental results are presented. Recommendations for future arrow design are forwarded. I. INTRODUCTION The equipment used in Olympic archery has improved dramatically over the past three decades. Most of these improvements were a result of new materials, such as carbon foams and fibers, which enabled arrows to be shot at greater velocities with less effort than previously possible, and improved manufacturing techniques, which have reduced the variability in performance between arrows in any given set. Modern equipment, as shown in Figure 1, and the rule that the string must be drawn and released by the Figure 1. An Olympic style recurve bow. fingers have made the skill of the archer the greatest contributor to misplaced shots. In competition, arrows are shot in sets of up to six arrows. The design of arrows in the past and present have thus focused on reducing the variability in the geometry, mass, and flexural properties between similarly constructed arrows. The reasoning was that if such variation were minimized, so would be the shot errors created by such variation. A typical arrow construction is shown in Figure 2. Many archery competitors spend a great deal of effort in selecting and matching the aforementioned properties in their sets of arrows. An arrow shaft is typically tubular in geometry, and constructed of aluminum, carbon fiber and epoxy, or a combination of these materials. Shafts designed for outdoor competition are typically as thin as practical, to be less affected by crosswind. The geometry, mass, and flexural properties of an arrow shaft are easily measurable quantities. Thus, manufacturing techniques have been developed to reduce the variation in these qualities such that shafts of the same model perform essentially identical to one another. The ability of the equipment to resist errors induced by the archer, or by variation in the equipment itself, is called its forgiveness. Equipment that is forgiving will produce less error in arrow flight than equipment that is unforgiving, for the exact same mistake made by the archer. 2 Point Shaft Vanes Nock Figure 2. Parts of an arrow. Actual Desired Corrected Windage force on vanes (a) (b) (c) Figure 3. Effect of vanes on arrow flight. The classical method of improving the forgiveness of the equipment is by tuning the arrow set to the bow and the archer. There are many tuning methods that are used, some of which are only qualitative in nature. Most tuning methods involve a process where the flexural stiffness of the shaft is selected based upon its length and draw weight of the bow from which it is shot. Further tuning involves selection of a mass for the arrow point, adjustment of the sideways force on the arrow produced at the arrow rest, and fine adjustment of the draw weight of the bow. Proper tuning of the equipment should minimize the probability that the arrow will strike the bow as the arrow is launched. 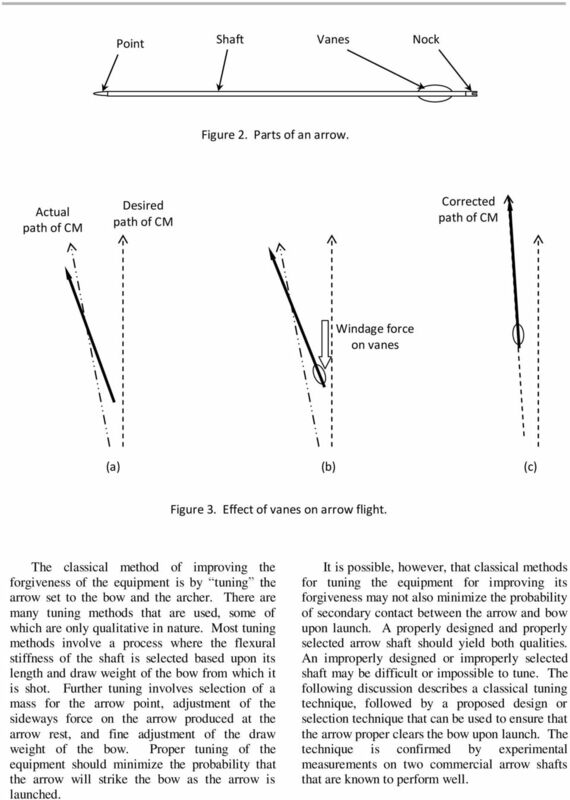 It is possible, however, that classical methods for tuning the equipment for improving its forgiveness may not also minimize the probability of secondary contact between the arrow and bow upon launch. A properly designed and properly selected arrow shaft should yield both qualities. An improperly designed or improperly selected shaft may be difficult or impossible to tune. The following discussion describes a classical tuning technique, followed by a proposed design or selection technique that can be used to ensure that the arrow proper clears the bow upon launch. The technique is confirmed by experimental measurements on two commercial arrow shafts that are known to perform well. 4 Desired Actual Spring loaded plunger Bow handle Small restoring force Force from bowstring Figure 6. Overly compliant plunger button. 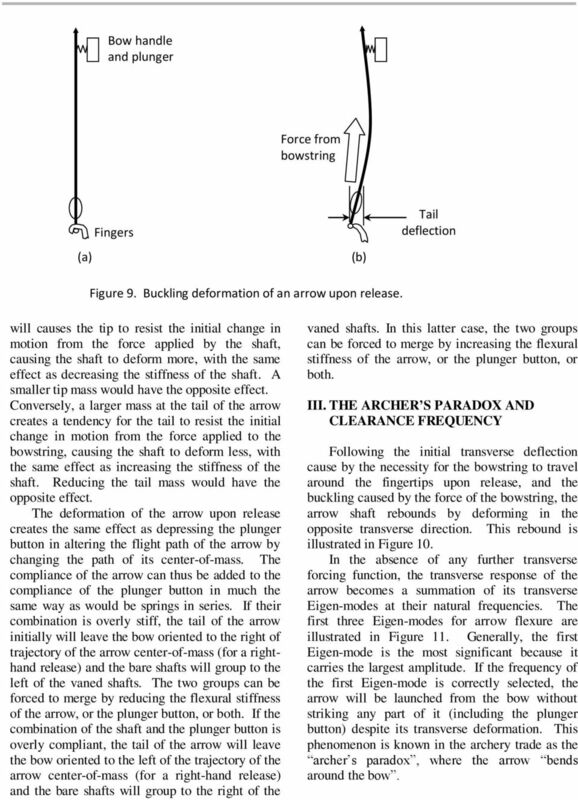 Deflection from fingers Actual Desired Spring loaded plunger Bow handle Force from bowstring Large restoring force Deflection from fingers Figure7. Overly stiff plunger button. it also imparts a force directed sideways at the bow handle. As a result, the plunger button is depressed. Figure 6 shows the result if the preload or spring constant is overly compliant. The tip of the arrow moves toward the bow handle, causing the tail of the arrow to be oriented to the left of the intended flight path. The error in the flight path would then be partially corrected by the vanes. The amount of correction can be minimized by adjusting the stiffness or pre-load of the plunger spring. 5 If the plunger spring is overly stiff, as shown in Figure 7, the tip of the arrow rebounds off the plunger, causing the tail of the arrow to be oriented to the right of the intended flight path. 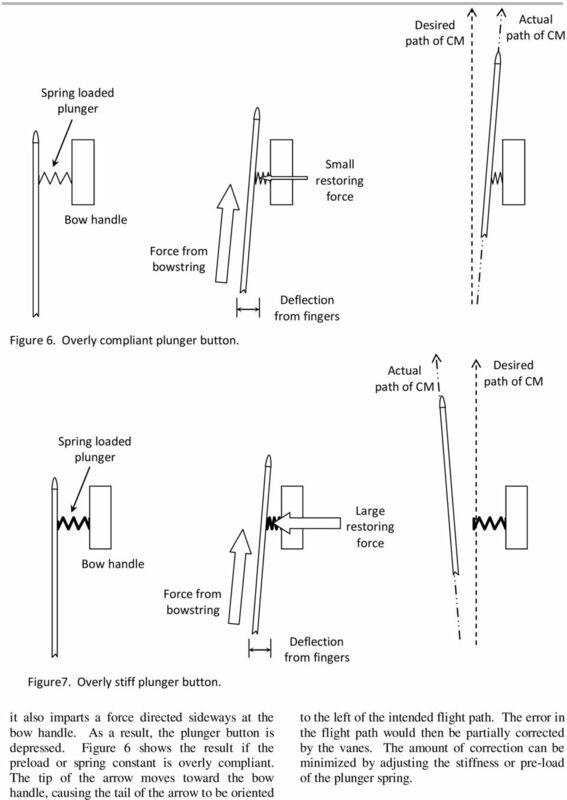 If however the stiffness of the plunger button is correctly chosen to compensate for the deflection error caused by the fingers upon release, the arrow would be aligned to the path of the centerof-mass, the bare shafts would group with the vaned shafts and the equipment would be tuned. The stiffness of the plunger alone cannot be used to tune the arrows to the bow, because the arrows themselves are elastic. 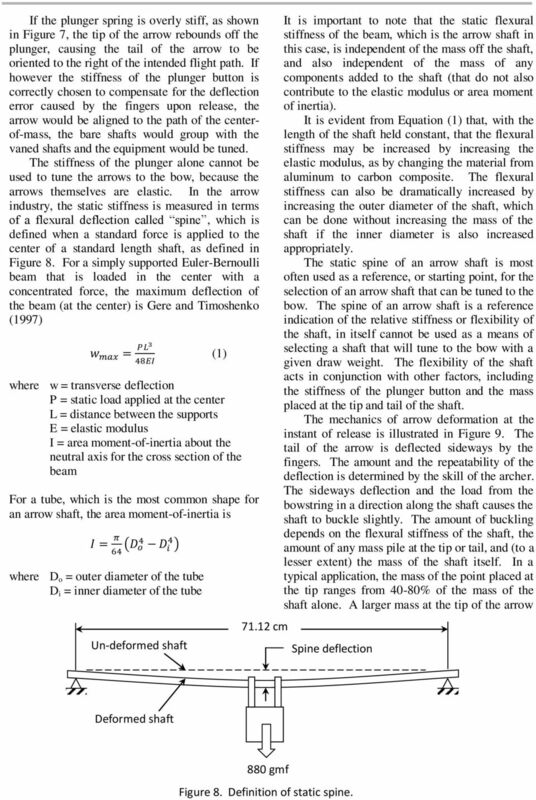 In the arrow industry, the static stiffness is measured in terms of a flexural deflection called spine, which is defined when a standard force is applied to the center of a standard length shaft, as defined in Figure 8. For a simply supported Euler-Bernoulli beam that is loaded in the center with a concentrated force, the maximum deflection of the beam (at the center) is Gere and Timoshenko (1997) (1) where w = transverse deflection P = static load applied at the center L = distance between the supports E = elastic modulus I = area moment-of-inertia about the neutral axis for the cross section of the beam For a tube, which is the most common shape for an arrow shaft, the area moment-of-inertia is where D o = outer diameter of the tube D i = inner diameter of the tube Un-deformed shaft cm It is important to note that the static flexural stiffness of the beam, which is the arrow shaft in this case, is independent of the mass off the shaft, and also independent of the mass of any components added to the shaft (that do not also contribute to the elastic modulus or area moment of inertia). It is evident from Equation (1) that, with the length of the shaft held constant, that the flexural stiffness may be increased by increasing the elastic modulus, as by changing the material from aluminum to carbon composite. The flexural stiffness can also be dramatically increased by increasing the outer diameter of the shaft, which can be done without increasing the mass of the shaft if the inner diameter is also increased appropriately. The static spine of an arrow shaft is most often used as a reference, or starting point, for the selection of an arrow shaft that can be tuned to the bow. The spine of an arrow shaft is a reference indication of the relative stiffness or flexibility of the shaft, in itself cannot be used as a means of selecting a shaft that will tune to the bow with a given draw weight. The flexibility of the shaft acts in conjunction with other factors, including the stiffness of the plunger button and the mass placed at the tip and tail of the shaft. The mechanics of arrow deformation at the instant of release is illustrated in Figure 9. The tail of the arrow is deflected sideways by the fingers. The amount and the repeatability of the deflection is determined by the skill of the archer. The sideways deflection and the load from the bowstring in a direction along the shaft causes the shaft to buckle slightly. The amount of buckling depends on the flexural stiffness of the shaft, the amount of any mass pile at the tip or tail, and (to a lesser extent) the mass of the shaft itself. In a typical application, the mass of the point placed at the tip ranges from 40-80% of the mass of the shaft alone. A larger mass at the tip of the arrow Spine deflection Deformed shaft 880 gmf Figure 8. Definition of static spine. 6 Bow handle and plunger Force from bowstring (a) Fingers (b) Tail deflection Figure 9. Buckling deformation of an arrow upon release. will causes the tip to resist the initial change in motion from the force applied by the shaft, causing the shaft to deform more, with the same effect as decreasing the stiffness of the shaft. A smaller tip mass would have the opposite effect. Conversely, a larger mass at the tail of the arrow creates a tendency for the tail to resist the initial change in motion from the force applied to the bowstring, causing the shaft to deform less, with the same effect as increasing the stiffness of the shaft. Reducing the tail mass would have the opposite effect. The deformation of the arrow upon release creates the same effect as depressing the plunger button in altering the flight path of the arrow by changing the path of its center-of-mass. The compliance of the arrow can thus be added to the compliance of the plunger button in much the same way as would be springs in series. If their combination is overly stiff, the tail of the arrow initially will leave the bow oriented to the right of trajectory of the arrow center-of-mass (for a righthand release) and the bare shafts will group to the left of the vaned shafts. The two groups can be forced to merge by reducing the flexural stiffness of the arrow, or the plunger button, or both. 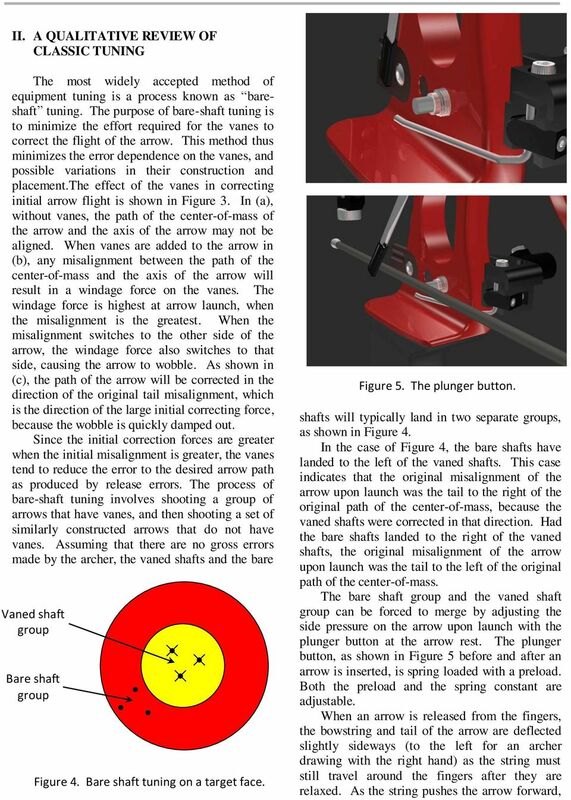 If the combination of the shaft and the plunger button is overly compliant, the tail of the arrow will leave the bow oriented to the left of the trajectory of the arrow center-of-mass (for a right-hand release) and the bare shafts will group to the right of the vaned shafts. In this latter case, the two groups can be forced to merge by increasing the flexural stiffness of the arrow, or the plunger button, or both. III. 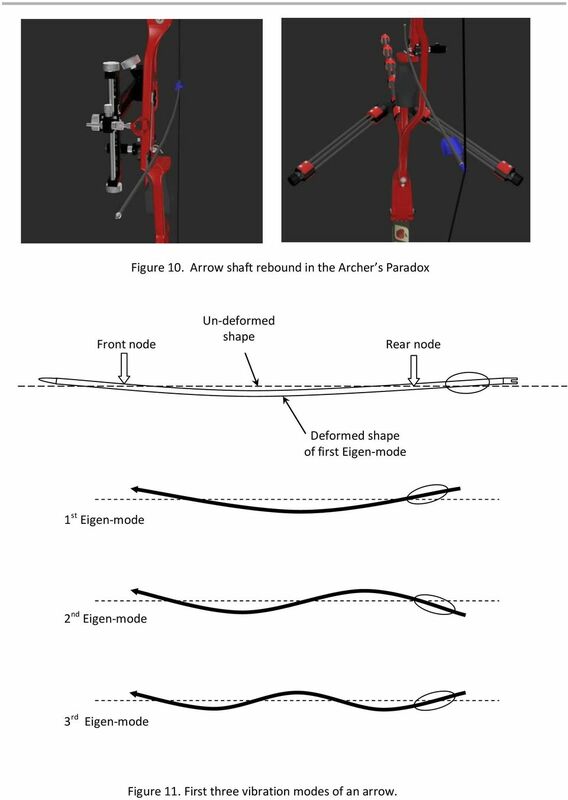 THE ARCHER S PARADOX AND CLEARANCE FREQUENCY Following the initial transverse deflection cause by the necessity for the bowstring to travel around the fingertips upon release, and the buckling caused by the force of the bowstring, the arrow shaft rebounds by deforming in the opposite transverse direction. This rebound is illustrated in Figure 10. In the absence of any further transverse forcing function, the transverse response of the arrow becomes a summation of its transverse Eigen-modes at their natural frequencies. The first three Eigen-modes for arrow flexure are illustrated in Figure 11. Generally, the first Eigen-mode is the most significant because it carries the largest amplitude. 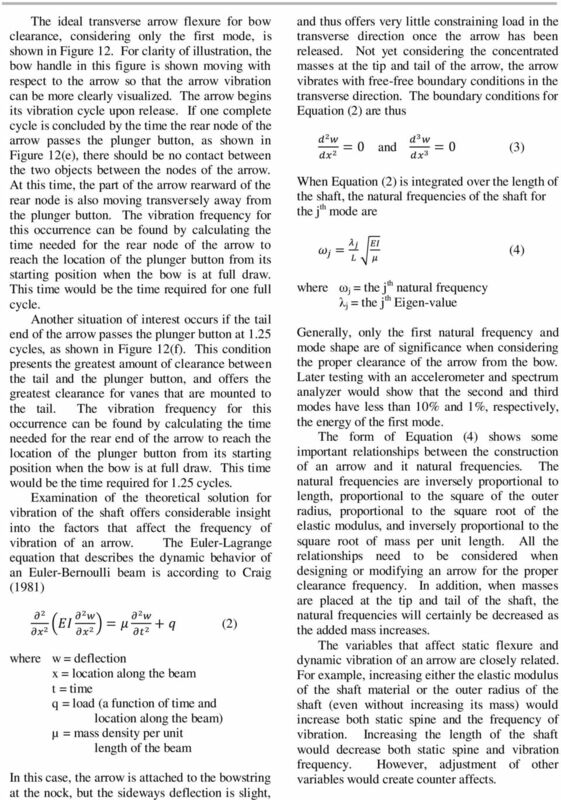 If the frequency of the first Eigen-mode is correctly selected, the arrow will be launched from the bow without striking any part of it (including the plunger button) despite its transverse deformation. This phenomenon is known in the archery trade as the archer s paradox, where the arrow bends around the bow. 7 Figure 10. Arrow shaft rebound in the Archer s Paradox Front node Un-deformed shape Rear node Deformed shape of first Eigen-mode 1 st Eigen-mode 2 nd Eigen-mode 3 rd Eigen-mode Figure 11. First three vibration modes of an arrow. 8 The ideal transverse arrow flexure for bow clearance, considering only the first mode, is shown in Figure 12. For clarity of illustration, the bow handle in this figure is shown moving with respect to the arrow so that the arrow vibration can be more clearly visualized. The arrow begins its vibration cycle upon release. If one complete cycle is concluded by the time the rear node of the arrow passes the plunger button, as shown in Figure 12(e), there should be no contact between the two objects between the nodes of the arrow. At this time, the part of the arrow rearward of the rear node is also moving transversely away from the plunger button. The vibration frequency for this occurrence can be found by calculating the time needed for the rear node of the arrow to reach the location of the plunger button from its starting position when the bow is at full draw. This time would be the time required for one full cycle. Another situation of interest occurs if the tail end of the arrow passes the plunger button at 1.25 cycles, as shown in Figure 12(f). This condition presents the greatest amount of clearance between the tail and the plunger button, and offers the greatest clearance for vanes that are mounted to the tail. The vibration frequency for this occurrence can be found by calculating the time needed for the rear end of the arrow to reach the location of the plunger button from its starting position when the bow is at full draw. This time would be the time required for 1.25 cycles. 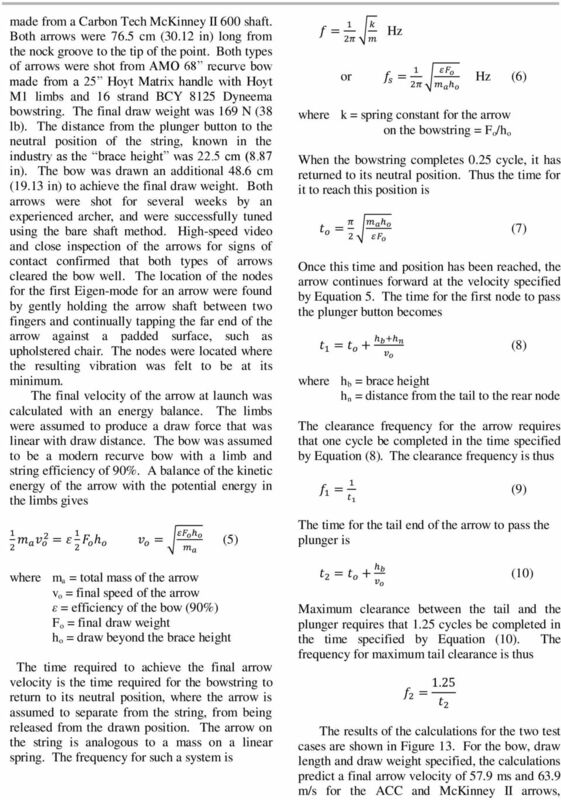 Examination of the theoretical solution for vibration of the shaft offers considerable insight into the factors that affect the frequency of vibration of an arrow. The Euler-Lagrange equation that describes the dynamic behavior of an Euler-Bernoulli beam is according to Craig (1981) where w = deflection x = location along the beam t = time q = load (a function of time and location along the beam) µ = mass density per unit length of the beam (2) In this case, the arrow is attached to the bowstring at the nock, but the sideways deflection is slight, and thus offers very little constraining load in the transverse direction once the arrow has been released. Not yet considering the concentrated masses at the tip and tail of the arrow, the arrow vibrates with free-free boundary conditions in the transverse direction. The boundary conditions for Equation (2) are thus and (3) When Equation (2) is integrated over the length of the shaft, the natural frequencies of the shaft for the j th mode are where ω j = the j th natural frequency λ j = the j th Eigen-value (4) Generally, only the first natural frequency and mode shape are of significance when considering the proper clearance of the arrow from the bow. Later testing with an accelerometer and spectrum analyzer would show that the second and third modes have less than 10% and 1%, respectively, the energy of the first mode. The form of Equation (4) shows some important relationships between the construction of an arrow and it natural frequencies. The natural frequencies are inversely proportional to length, proportional to the square of the outer radius, proportional to the square root of the elastic modulus, and inversely proportional to the square root of mass per unit length. All the relationships need to be considered when designing or modifying an arrow for the proper clearance frequency. In addition, when masses are placed at the tip and tail of the shaft, the natural frequencies will certainly be decreased as the added mass increases. The variables that affect static flexure and dynamic vibration of an arrow are closely related. For example, increasing either the elastic modulus of the shaft material or the outer radius of the shaft (even without increasing its mass) would increase both static spine and the frequency of vibration. Increasing the length of the shaft would decrease both static spine and vibration frequency. However, adjustment of other variables would create counter affects. 12 methods, tail mass for additional forgiveness and tunability by classical methods, and arrow frequency for proper clearance. Endevco 104 Endevco 109 HP 35660A Endevco 22 Figure 14. 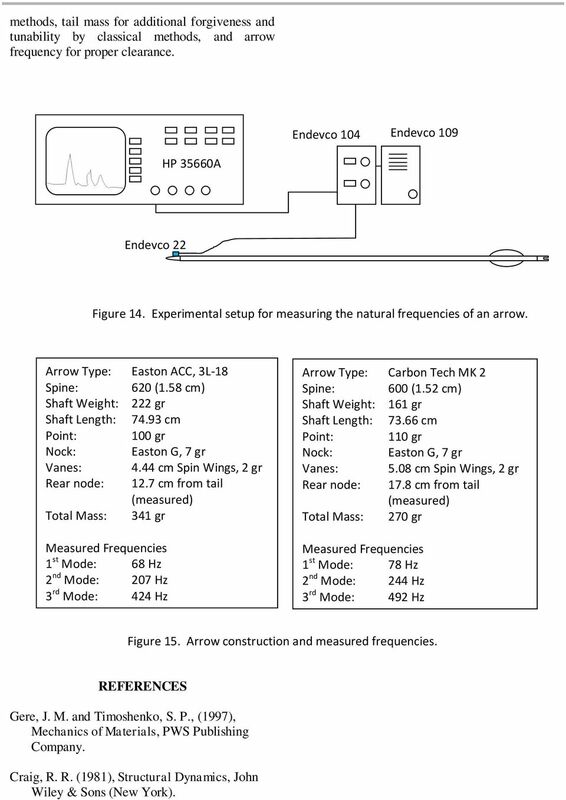 Experimental setup for measuring the natural frequencies of an arrow. Arrow Type: Easton ACC, 3L-18 Spine: 620 (1.58 cm) Shaft Weight: 222 gr Shaft Length: cm Point: 100 gr Nock: Easton G, 7 gr Vanes: 4.44 cm Spin Wings, 2 gr Rear node: 12.7 cm from tail (measured) Total Mass: 341 gr Measured Frequencies 1 st Mode: 68 Hz 2 nd Mode: 207 Hz 3 rd Mode: 424 Hz Arrow Type: Carbon Tech MK 2 Spine: 600 (1.52 cm) Shaft Weight: 161 gr Shaft Length: cm Point: 110 gr Nock: Easton G, 7 gr Vanes: 5.08 cm Spin Wings, 2 gr Rear node: 17.8 cm from tail (measured) Total Mass: 270 gr Measured Frequencies 1 st Mode: 78 Hz 2 nd Mode: 244 Hz 3 rd Mode: 492 Hz Figure 15. 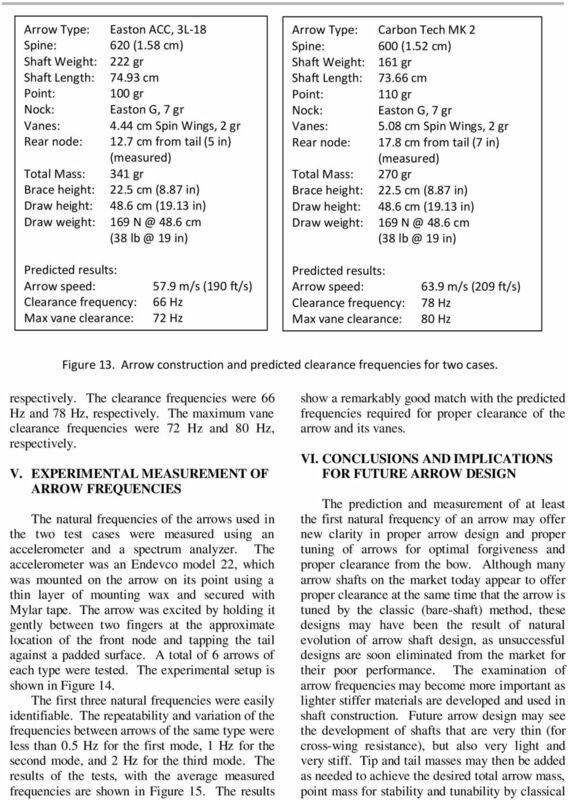 Arrow construction and measured frequencies. REFERENCES Gere, J. M. and Timoshenko, S. P., (1997), Mechanics of Materials, PWS Publishing Company. Craig, R. R. (1981), Structural Dynamics, John Wiley & Sons (New York). MATERIALS AND SCIENCE IN SPORTS Edited by: EH. (Sam) Froes and S.J. 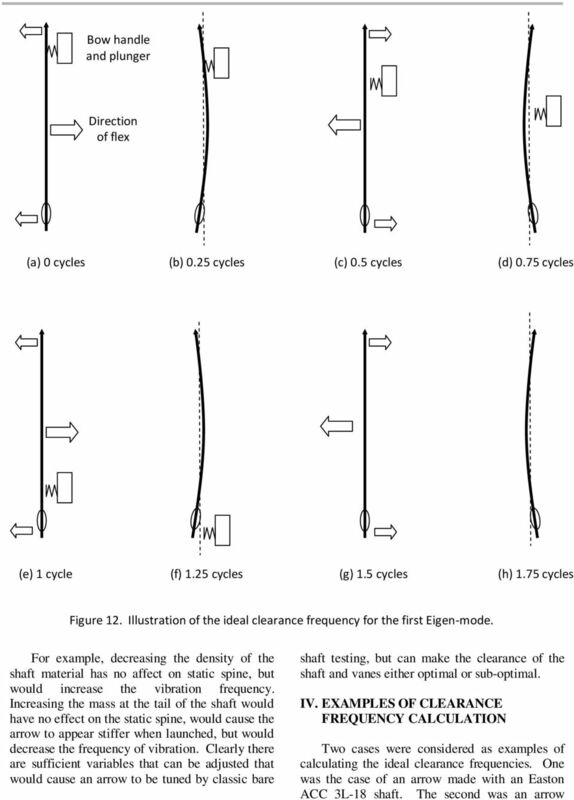 Haake Dynamics Analysis of the Characteristics of Fishing Rods Based on the Large-Deformation Theory Atsumi Ohtsuki, Prof, Ph.D. Pgs.